Does anyone have experience with the OER repro mirror for 1968 ? I had a devil of a time with the orig. GM interior mount....wrong shape on the remote head casting of the repro mirror. I fixed this with minor filing. Now I notice the mirror panel itself seems too loose. This is a showstopper. No experience installing one, but I was at Classic Industries a few months ago and noticed there aren't any drain holes! I think that's probably going to be the major show stopper here. Well I'm on mirror #2 and have the same problem. The glass is loose in the housing at all posistions. Seems OER has no known phone number for customer service. I emailed their general mailbox via their website to see if they have a solution. Anyone know how to contact OER? I'll ask about the drain holes but i have a broken original and i don't see where they drain either. I just looked at the original remote mirror on my '68 Z/28. There are two drain holes on the bottom of the mirror housing on either end. These two drain holes are very close to the back of the mirror housing. A 1/8" drill bit fits snug in these holes. Hope this info helps. If you're buying a new side view mirror, buy it from Paragon Reproductions, they are the best and they will date them for you! They are tight so the mirror will not blow down out of adjustment while driving down the road. 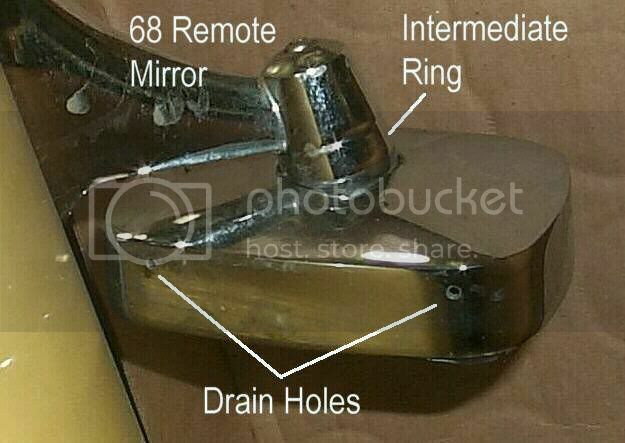 68's have the style that have two small (about 1/8" in diameter) drain holes on the bottom of the mirror housing, one on each side (see the top picture). Starting in late 68 (I'm not exactly sure of the exact date) Donnely changed the housing. It now had a single "oblong" 1/2" slot on the bottom, center of the mirror (see lower picture). I've verified this on two seperate mirrors, both dated 7DMI8. One had the "holes" and the other had the "slot"! So sometime in July 68, the change was made. As this is VERY late for 68 cars, I can't be sure if ANY 68's came with the newer ("slot") style, but I would imagine some very early 69's came with the older ("Two hole") style. Also note that 68's have an "Intermediate" Adjusting Ring. Since this same mirror was used on all Chevrolet body styles, the assembly could be adjusted for different mountings. Loosen the screw, adjust the ring and tighten the screw. In 69, Chevrolet went to different mirrors for different models, therefore no adjusting ring was necessary. Based on your example above my date code translates to December 1967. Is that correct? Yup. December, 1967. I've seen a lot of Remote Mirrors with that date. Donnely must have made a BIG batch that month!! Thanks for the Paragon lead Jerry. The photos were very useful. Paragon only carries the regular O/S mirror not the remote version. That first one is a 69 Mirror and the 2nd one I can't find in my books, although I DID find the bezel. 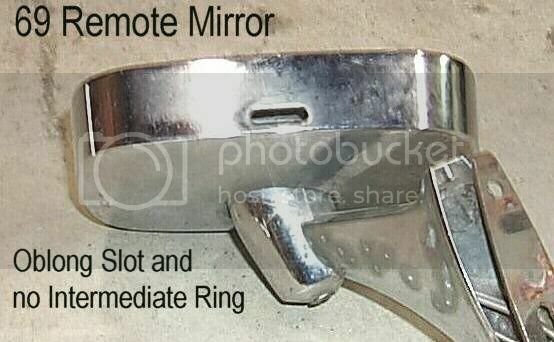 It was used on the 69 Corvair with Remote Mirror. What book are you finding this information in and where can I get one?